Lately in a conversation with a local Geneva architect, we talked about the strange place (which I live in) that includes a shopping centre called “Planete Charmilles” and he thought that this very dense building complex was an example of how a shopping centre could be urban. My first reaction was to reject the idea that any shopping centre could be urban even though it might be less “un-urban” compared to the classic style shopping centre – a box surrounded with parking. The typical shopping centre is one of the strongest forces of (un)urban fragmentation (being mono functional, purely market driven, privatising potentially public space and dominated by the use of the car) Planete Charmilles is different since it is woven into the urban fabric of our area and has entrances to the street. These three entrances do have signs of urban life. Especially the entrance with small corner shops that I pass several times every day is little local microcosm of everyday life. So what makes this place urban? 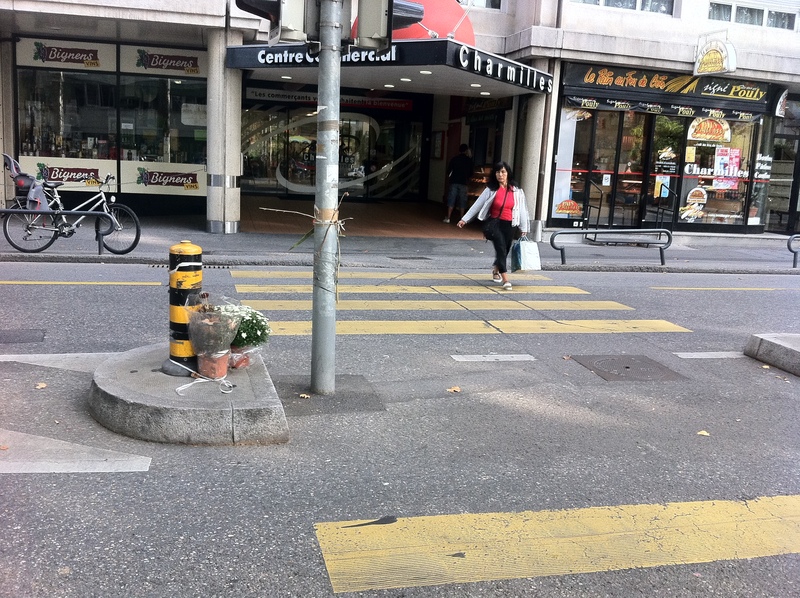 One of the things that makes the place really stand out is the small improvised (urban) “Memorial” for somebody who died in a traffic accident just at the street crossing outside the entrance to the shopping centre. 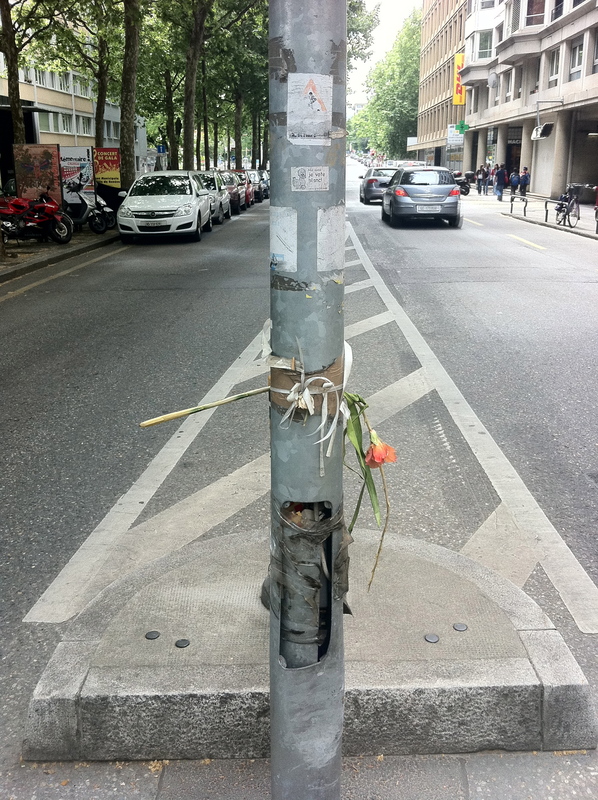 For years this improvised Memorial has been there with plastic flowers attached to the light pole (many traces of scotch tape shows the time go by) and real flowers are placed there to dry out – just like the grave yard. It looks like people do steal the artificial flowers but there is an unwritten rule: that the last one always stays which makes it look even more miserable and sad. Every year flowers are refreshed. This “Urban Memorial” marks a stark contrast to the shopping centre with its controlled atmosphere behind the sliding doors just 10 meters away. The sad but also beautiful character could never be part of any “be happy don’t worry (but shop)” atmosphere of the shopping centre. Everything that could make potential costumers uncomfortable is avoided just like the physical surroundings are kept at a comfortable level when it comes to temperature, humidity, sounds etc. Nothing in this artificially regulated atmosphere is supposed to challenge you as long as you can pay.This is part of a more subtle mental fragmentation of the city that makes it less urban: There are places for careless (market driven) pleasure and other places for sadness and feeling of loss in spite of everyday life always being a mix of these feelings. What also makes the entrance to the shopping centre more urban is a more recent phenomenon: behind the sliding doors is a no smoking zone which makes the entrance a popular place for smokers. Where the controlled atmosphere inside the shopping centre is now smoke free (but symbolically rather low on oxygen) it exports this problem into the public (and less controlled) space which makes the entrance a place to hang out for the smoking outcasts (quite urban in that way). The entrance literately becomes a grey zone between public and private space. Like a purgatory you have to pass before you can enter the smoke free and careless atmosphere of the shopping centre. As a contrast to the memorial to somebody who died or the smokers who might be (challenging death) what really matters in this space is the mornings where I pass by on the way to school with my daughter. The two corner shops on each side of the entrance are truly part of the local fabric both in a functional sense supplying people with bread and sandwiches on one corner and beer and wine on the other but most importantly they are mostly populated with people who enjoy to be part of public space. This means that every morning we are saying good morning, waving, blowing kisses (depending of who is there) and later in the day when time is less precious its time for a little gift from the bakery or a talk about how the Danish team did in football or he’s latest trip to the october beer fest in Munich. This makes the passing and stopping for a short talk a pleasure while greeting some of the more stable smokers in the same space. The two corner shops are in a dense position where many people pass by every day to make it “urban”. But in this case the place is only really “urban” when it is the Portuguese guy in the wine and beer shop or the Colombian woman in the bakery are there. Those are the people who enjoy to be part of public space and in the end makes it urban. At other times it is not the same. What is urban? Its all about the people and how they inhabit a place and interact with each other. It is about how people are able to inhabit a place and make it personal and it is how people enjoy the urban space in the good company with other people. Is the shopping centre Planete Charmille more urban than other shopping centres? Not really – it might be less “un urban” as mentioned already but being woven into the local fabric in a physical sense makes it easier to see how its not really urban and the entrances are not urban because of the shopping centre except that it creates a critical mass of people either passing to and from the centre or hanging out there to smoke. But that same Critical mass of people is sucked into the mono functional atmosphere of the shopping centre which makes the surrounding neighbourhood equally mono functional with only a few shops and cafes etc – they are all inside the sliding doors of the centre. Often “urban” is seen as the same as an area being dense and thus focusing on the more quantitative aspects, and even though it seem obvious that the urban is also the qualitative (social and cultural) aspects too it is often overlooked or seen as an automatic consequence of the place being dense. These qualitative aspects are things that are not to be planned or controlled like the shopping centre is and they are much more complicated if one look at it from a rational perspective. But on an emotional level its often much simpler: an urban space feels good – not in the predictable way of a shopping centre, but because it is inhabited with real people and has a diverse sensory and emotional richness from the weather that changes to the improvised memorial for somebody who died. I wonder if the qualitative aspects of urban life are overlooked because the controlling perspective of the way an architect shape a building is also applied to urban life. The problem here is maybe not the controlling perspective in it self – we do want buildings that are build properly and doesn’t collapse – but the problem might be that the controlling perspective of architects creates a blind spot towards the qualitative aspects. In short there is a need for a more holistic approach where architects work with other professions and especially take the time to go much more local than is the case today. Posted on 14/10/2011 27/09/2017 by jensbrandtTagged Blind spot of architects, Geneva, Shopping centre, Urban. Next Next post: Urban Oeuvre and/or an architectonic Masterpiece?